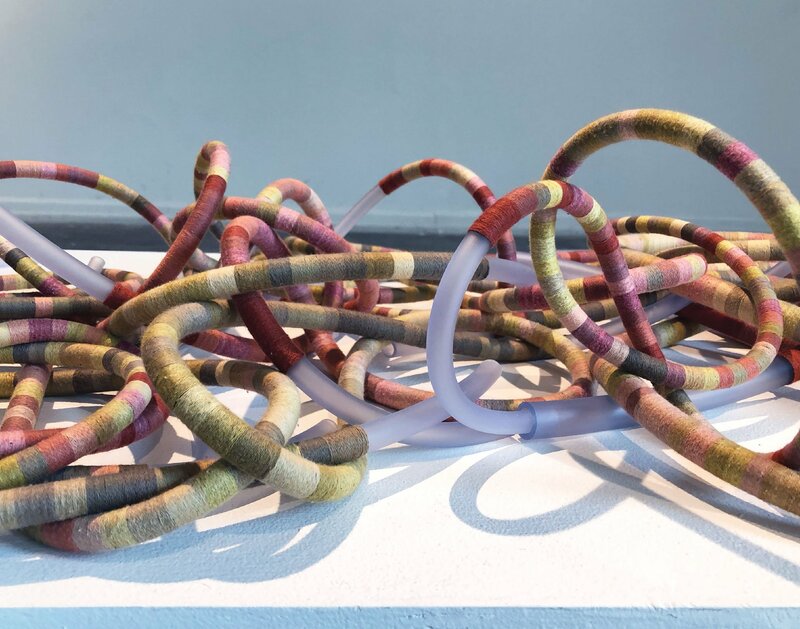 Bound, a growing installation—a woven material data map—charts, maps, and traces multiple forms of entanglement in the face of anthropogenic climate change. When complete, Bound will be composed of more than three hundred sets of data from the National Oceanic and Atmospheric Administration (NOAA) and over 1,500 feet of thread-wrapped medical tubing. The photos that follow show early iterations of this project. Climate change is often communicated as data, a simplified form we can consume quickly. Our embodied experiences of climate change, however, are not visible in this data. These individual embodied experiences are chaotic, complex, and varied; shaped by the entanglement of significant shifts in weather patterns with many other systems and structures (gender, race, class, health, geography, policy, and the like). Photo of work in progress. 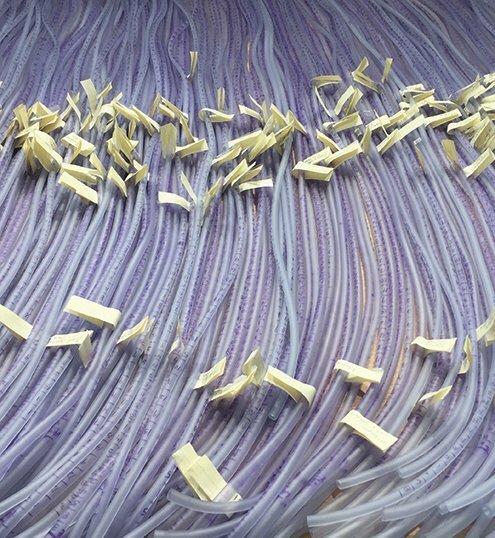 Over three hundred sets of data for annual average temperature at varying geographic scales, from cities to the globe, are marked out on over 1,500 feet of medical tubing, ready to be wrapped with thread. Each length of medical tubing corresponds to a single dataset (for example, annual average temperature for the Northern Hemisphere, annual average temperature for a U. S. state, annual average temperature for a city). The tubes vary in diameter from 5/16″ to ¾”, corresponding to geographic scale. A city, for example, maps to a 5/16″ diameter tube, while the full globe maps to a ¾” diameter tube. The numbering on the tubes indicates the thread color to be wrapped for that section. The thread colors, moving from green-grays to yellows to red-pinks, are an interpretation of rising temperatures. Medical tubing cut to fivefoot lengths and ranging in diameter from 5/16” to ¾”. Petrochemical pipelines penetrate the globe, physically entwining the fate of organisms from deep geologic time, present, and future. There is a relationship between the damage done to the earth and the damage done to our bodies by the petrochemical industry, and yet our lives are also reliant on and entangled with this industry. Petrochemical-derived medical tubing is a pipeline that runs through and around our bodies. It is used for drug delivery in chemotherapy, wound drainage, and dialysis equipment—medical interventions for illnesses that often have the same causes as ecological destruction. 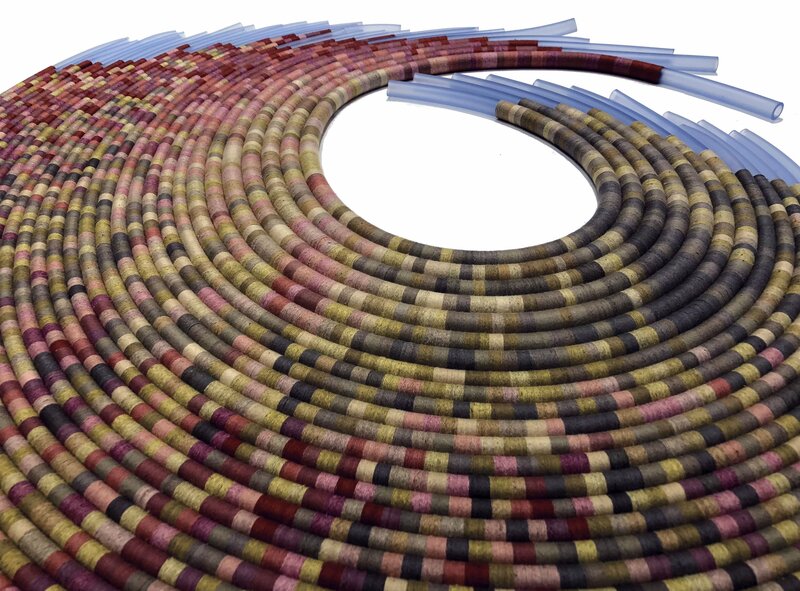 Each length of thread is dyed with plant- or insect-derived dyes and mineral mordants—a global practice that stretches back to long before the age of oil and the production of petrochemical­-derived synthetic dyes. Each dataset, expressed along a length of tubing using varying colors of thread, is annual average temperature for a different city, state, or region of the world. Geographic scales range from cities to the globe. Each place has its own climate, and therefore experiences climate change uniquely. And yet we are all connected and part of a larger whole, no matter our personal or local experience of climate change to date. Bound (i. 1.) (May 2018), the first fifteen of what will be over three hundred sets of climate data; medical tubing, organic thread dyed with plant- and insect-derived dyes and mineral mordants. Installation size variable. Each time I exhibit Bound, the individual tubes can be reconfigured to evoke varying aspects of our relationship to climate. In (i. 1. ), the thread-wrapped tubing is arranged as a 65″ x 22″ x 10″ knot. Bound (i. 2.) (August 2018), the first thirty-two of what will be over three hundred sets of climate data; medical tubing, organic thread dyed with plant- and insect-derived dyes and mineral mordants. 48″ x 40″ x 1″. Bound (i. 2.) references the swirl of a storm across a weather map.